Memphis is one of the cities I have visited during my vacation. The city is very unique. Beale Street always seems to have a buzz. The blues music that Memphis is famous for can be heard in almost store or restaurant and gives the city its own flavor. Right on the banks of the Mississippi River and once home to Elvis Presley, the city is proud of its distinct Southern feel. Memphis is also the home of the NBA’s Grizzlies. As I was enjoying Memphis’ one of a kind Beale Street and blues music, I was thinking about what makes Greivis Vasquez, the Grizzlies’ second-year guard out of the University of Maryland, a special player. Vasquez’s statistics and the awards he won are part of the reason why he will go down as one of the top five players of all-time at one of the nation’s most storied basketball programs. As a junior, when he really started to mature as a basketball player and leader on the court, Vasquez led the Terps with 17.5 points, 5.4 rebounds, five assists, 1.4 steals and 34.6 minutes per game, becoming the first Maryland player and only the sixth ACC player ever to lead his team in points, rebounds and assists. He was honored as a second-team All-ACC selection at the end of the season, the first time he would receive any kind of collegiate award. After flirting briefly with the NBA Draft, Vasquez elected to return to Maryland for his senior season. He took his game to another level in his final season under legendary head coach Gary Williams, averaging 19.6 points, 6.3 assists, 4.6 rebounds and 1.7 steals per game. Vasquez was the only player in the country to average at least 18 points and six rebounds per game. He was named the ACC Player of the Year and a second-team All-American while also winning the Bob Cousy Award, given to the nation’s top point guard. Vasquez also became the only player in ACC history to register at least 2,000 points, 700 assists and 600 rebounds. There are so many athletes who put up great numbers early in the game or against weak opponents. But against the toughest competition or in the clutch, they crumble. Vasquez was the opposite. He often struggled against weak competition in low-pressure situations, but was always able to elevate his performance in the biggest contests against the top opponents. In his final two years at Maryland, he was the always the guy Williams wanted to get the ball to in dire moments late in games. At home against No. 3 North Carolina in his junior year, Vasquez scored 35 points while grabbing 11 rebounds and dishing out 10 assists, recording just the third triple-double by a Maryland player in history and the school’s first since 1987. In his senior year, again at home, this time against Clemson, a sluggish first-half had the Terps down by as many as 15 points. Vasquez led a furious second-half comeback and capped a 12-0 run to take the lead with a steal followed by an emphatic dunk. In a tough late ACC road game against a charged-up Virginia Tech squad that had not lost at home all season. In a seesaw battle, Vasquez lifted Maryland to a double-overtime victory, scoring a career-high 41 points, becoming the first Terrapin player to reach 40 points in a game since Joe Smith in 1995 and the ninth ACC player ever to tally more than 40 points in a conference game. In perhaps the most memorable game in his career, the Terps hosted No. 4 Duke on Vasquez’s Senior Night with the ACC regular season championship hanging in the balance, the final game he would play at the Comcast Center. Vasquez scored 20 points, including some crucial late-game buckets to secure a 79-72 Maryland victory and lead the Terps to a 13-3 ACC record and tie with the Blue Devils for the ACC regular season title. 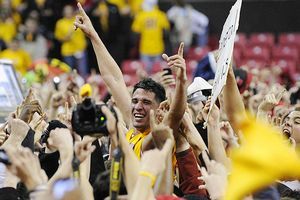 Vasquez continued to thrive in the clutch in college basketball’s biggest stage, the NCAA Tournament. In the second-round, the fourth-seeded Terps battled the fifth-seeded Michigan State Spartans. With 12 minutes to go in the second half, Maryland trailed by 16 points. Vasquez sparked a late comeback. He scored nine of the Terps’ 11 points in the last two minutes to give Maryland an 83-82 lead before Korie Lucious’ buzzer-beating trey gave the Spartans the victory. Still, without Vasquez continuing to battle, the Terps would have been blown out before coming within one defensive possession of the Sweet Sixteen. Greivis Vasquez’s statistics and awards certainly make him a special player. But like the city he plays in, Vasquez’s game has a bit of flare, pride and passion that make him unique. The way he has fun playing the game of basketball and is able to channel his positive energy into leading his teammates, as well as his ability to elevate his performance in the biggest games and in the direst moments, add to what makes him a special basketball player. Greivis Vasquez’s numbers don’t tell the whole story. It’s that little bit extra that he brings to his teammates and to the game of basketball that paints the whole picture about why he is a great basketball player. This entry was posted on August 12, 2011 by Scott Kornberg. It was filed under Greivis Vasquez, Maryland Terrapins and was tagged with ACC, All-American, Blue Devils, Bob Cousy Award, Duke, Gary Williams, Greivis, Greivis Vasquez, Hokies, Maryland, Maryland Terps, Maryland Terrapins, North Carolina, Scott Kornberg, Tar Heels, Terps, Terrapins, UNC, Vasquez, Virginia Tech, VT.